Cookie recipes written by computers. It’s hard to mess up a chocolate chip cookie. In the 80 years since the treat’s invention, thousands of recipe variations have been written to make the treat more gooey, crispy, chewy and generally tastier than its predecessors. Yet, it’s possible that this go-to dessert’s tastiness can be pushed even further. We wondered if there was a way to leverage computers and hundreds of pre-existing recipes to create the most average chocolate chip cookie. Would it be bland and unremarkable? Or, perhaps like averaging human facial features, the results would be even better than each of its individual parts. Maybe an average cookie would be the most delicious of them all. But what is an average cookie? We decided to interpret this idea using three different methods: a mathematical average, predictive text algorithms, and neural networks. After feeding each algorithm over 200 chocolate chip cookie recipes, they each generated something new. And, yes, we actually baked them. For our first attempt, we threw our recipe-creation back to grade school and just straight up averaged the amount of every ingredient in our set of recipes. That means we calculated the average amount of flour, and the average amount of butter, and so on. Of course, that leads to some unusual complications like non-integer quantities (how do you measure 2.85 eggs?) and ingredients that appear sparingly in the data set, like molasses or black pepper, get seriously watered down in the average. We could pretend they’re not there, since who can taste 0.002 cups of applesauce in a batch of 48 cookies? But for science, we decided to keep all 60 ingredients. 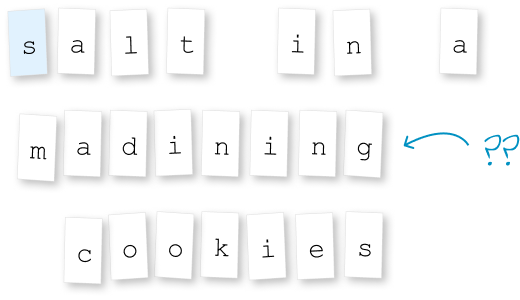 Collect words used in the chocolate chip cookie recipes. Group words together that are used similarly in the recipes. If these words were grouped on a graph, we could assign a numeric value to each word based on where it falls on the graph. This number is called a “word vector”. Then we can use these word vectors to find the average value for an entire sentence. This is called a “sentence vector”. If we look at all of the sentences from our recipes, we’ll find that many have slightly different meanings, but very similar sentence vectors because they contain similar words. Now, if we group all of the sentences with similar sentence vectors together on a graph, we’ll end up with groups of similar sentences. Last, we find the sentence that is closest to the center of each group and use those sentences for our recipe instructions. Using this method, we found about 9 distinct clusters of sentences and by picking the sentence closest to the center of each one, we ended up with recipe instructions that actually work pretty well. Although, we did have to decide when to add the 50+ ingredients that didn’t end up in our sentence vectors. Next, we decided to try something a bit more complicated called predictive text. Essentially, predictive text is like the autosuggest feature in a messenger app: you start with one word, and it gives you suggestions for the words that might follow. The suggestions you receive on your phone most likely come from a pre-loaded program that “learns” based on your texting habits. What if predictive text only knew about the word usage in chocolate chip cookie recipes? That’s the question behind this experimental cookie. Select three words that appear in the recipe text in order. Find which 4-grams from our dictionary contain those 3 words, in that order. Imagine that we chose the first option, “combine the flour,”. Now we need to find 4-grams that overlap with our choice. If we choose the 3rd option, “the flour, salt” we now have added two words to our original string (technically, a word and a punctuation mark). To speed this up, we automate the process, but the computer needs to know which 4-gram to pick. We used a process guided by probability - so 4-grams that occur often are more likely to be chosen than 4-grams that occur only once. Using predictive text generated a pretty follow-able recipe, but it can have some issues. If we chose the single most common 4-gram every single time, we can find ourselves stuck in an endless loop. Look what happened when our computer ran into one very unusual ingredient - cannelini beans. To save our recipe from endlessly looping (and to save our tastebuds from whoever is putting beans in cookies! ), we removed the cannelini-filled recipe from our dataset. Our last recipe was created using deep learning, one of the most compelling recent advances in artificial intelligence. An algorithm called a neural network has changed the game in facial recognition, speech recognition, and image processing in the last few years. Neural networks train on a set of data, like a set of pictures, text documents, or cookie recipes, and can learn the patterns inherent in its input without very much guidance, if any, from humans. Collect the ingredients and directions from lots of chocolate chip cookie recipes. The neural network needs to find patterns in these words, so it breaks up all of the words into individual letters. The algorithm looks for patterns in how a single letter is used and what other letters typically come before or after it. This is called training. After the neural network has trained on enough recipes, it can begin to guess how a recipe would be written. So, if you give it a randomly assigned letter, it can try to guess which letters might come next. It continues letter by letter until an entire recipe emerges. Watch out for made-up words! Because neural networks piece together language letter by letter, it doesn’t have any understanding of the meaning of words in recipes and so sometimes, it makes up new words. ...And repeated or missing ingredients! Neural networks are great at learning the format of a typical recipe, but they’re not so excellent at understanding which ingredients go together. It may not realize that it already added a cup of sugar and will then suggest that you add another cup of sugar to your ingredients...and another...and another. It also may not notice that some ingredients, like eggs, are important, so they may be left out completely. Our computer gave it a valiant effort and did create three brand-new recipes! Whether or not we can qualify their creations as true chocolate chip cookies is still to be decided. If you wanted to give these cookies a try, feel free to save the recipes, bake them yourself, and then let us know what you think! 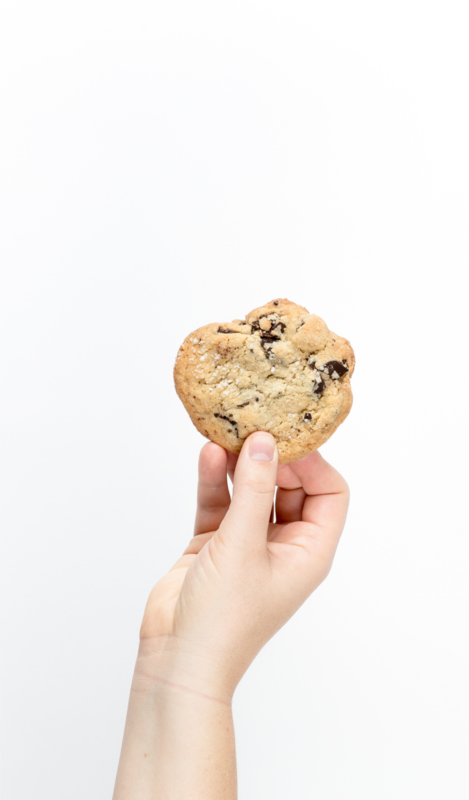 Oh, and if you don’t want hundreds of cookies (created from our recipes or your favorites), spread the love and that cookie-goodness with friends, family, or co-workers, have a bake sale to raise funds for hungry kids, or donate them. After all, it’s hard to go wrong with chocolate chip cookies. We searched the internet, including recipe databases AllRecipes and Epicurious, for chocolate chip cookie recipes. Our search returned 915 recipes. We removed any recipes that were not representative of traditional chocolate chip cookies using several criteria: the title could not contain another dessert (e.g., “Chocolate chip cookie ice cream sandwiches” or “Chocolate chip cookie cake”), a flavor could not be mentioned in the title (e.g. “Peanut butter chocolate chip cookies” or “Banana chocolate chip cookies”), and the title could not identify the recipe as an alternative formulation of the cookie (“Vegan” or “Gluten free”). This brought our sample of traditional chocolate chip cookie recipes down to 221. Before any of the text processing or averaging methods were applied, recipes were scaled to make 48 servings. Note that our text processing methods (specifically, the neural network and predictive text) produced instructions that were not always physically possible to complete. For example, ingredients are listed but not used in the instructions, and instructions sometimes reference ingredients that were never listed. As we attempted to make these recipes, we sought to adhere as closely to the recipe as possible, but making guesses as required. Many thanks to Jan Diehm for design assistance on this story and for the header photograph. Hungry for more computer-generated recipes? We weren’t the first ones to use computers to generate new recipes and (we hope) we won’t be the last! Check out these recipes for pie, cake and much more. If you’re more of a cooking-show fan, you may enjoy watching Elle make a Thanksgiving dinner, a Valentine’s Day dessert, and a mystery meal all generated by various algorithms. Sift together the flour, baking powder, baking soda and salt into a medium bowl and set aside. In another bowl, using a handheld mixer on medium-high speed, beat together the butter and the granulated and brown sugars until the mixture is light in texture, about 3 minutes. Add the vanilla and the egg; beat on low speed until just incorporated 10-15 seconds or so (if you beat the egg for too long, the cookies will be stiff). Stir in the chocolate chips. Spoon rounded tablespoonfuls of cookie dough onto 2 parchment paper-lined baking sheets, spacing 1" apart. Working with 1 large tablespoons of dough at a time, roll them into balls and place them on a cookie sheet (lined with parchment paper or a baking mat) about 2 inches apart. Bake for 8 to 10 minutes in the preheated oven, or until edges are golden. Let the cookies cool on the baking sheet for 2 minutes then transfer to a wire rack to cool completely. In a medium-sized mixing bowl , beat butter , brown sugar and white sugar until smooth . ( no mixer needed just use a wooden spoon , stir in walnuts if desired . Refrigerate cookie dough for two hours or until firm . Line a baking sheet lined with parchment paper . Whisk flour , baking powder , and salt in a small bowl . using an electric mixer until fluffy , 3 to 4 minutes . add egg and egg yolk until light and creamy . beat in the eggs one at a time , then the chips . Use a large cookie scoop onto baking sheets . Flatten mounds into 3-inch rounds using moistened palm of your hand . Bake for 7 minutes in the preheated oven , or until browned. Sift together the flour, baking soda and salt in a madining cookies on the middle and for 12 to 15 minutes or until light and fluffy. Beat in eggs and vanilla until the cookies are golden brown, about 10 minutes if using a mix. Stir in chocolate chips and walnuts. Whisk the flour, baking soda and salt in large bowl with an electric mixer with the eggs and vanilla. Remove from baking sheets to cool on baking sheet for 5 minutes. Transfer cookies to bake for 10 to 12 minutes or until cookies are set and the cookie sheet. Bake for 10 to 12 minutes on the pans and mixing with baking sheets with parchment paper.